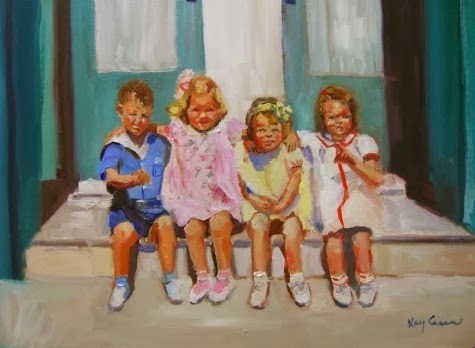 Like a candy bar, king-size of course, I share the love of God with a neighbor girl, her twin sister, and their friend. I divide it into fourths—more like thirds and a bit. I take the bit because it's good to eat with your guests and leave them the fuller share [and] because their eager grins and needful eyes demand it. We sit on the stoop, shoulder-to-shoulder-to-shoulder-to-torso, and devour the chocolate treat. Passing us by in the street, teenagers are deaf to my greetings, blind to the girls giggling, dumb to any offer of a candy bar. But the girls can't sit still for long, and they're up bouncing around like spinning tops asking about the scar on my head or the hair on my arms or my habit—why you dress like that? Is you really a father? Do you have any soder to drink? They carry with them an innocence, a joyfulness that I know will flee from them in a few years when I, seated with another set of kids, will watch them pass us by, too cool to talk to the monk, but that can’t stop me from grabbing the soder and some plastic cups. The girls will come back tomorrow and the next day and the day following that, and I know that one of these days, one of them will take the candy bar, and instead of devouring it thoughtlessly, she will put it in her pocket, take it home, and cherish it later. And that little bit of love, that memory, will always be one small string in her heart that Jesus will be able to pluck down the road as he wishes.